In a scene eerily reminiscent of George Lucas’ multigenerational blockbuster the Star Wars saga, several imperious governments around the planet have recently declared all-out (or in some cases partial) war against Bitcoin and the other junior cryptocurrencies. Yet in most cases, they are not determined to destroy the digital currency concept entirely. Make no mistake, this new virtual war is all about control over the alternative currencies. As the old adage, “whoever has the gold makes the rules” goes, the nation (or nations) who are able to subvert this new trend in the future of money to their own will become the next great global financial leaders. In this article we look at four different approaches the governments are using to try to kill Bitcoin and any other cryptocurrencies over which they do not have direct control now. These statements laid to rest the idea that Russia is in an all-out war with the idea of digital currencies. Rather it is that they do not like the decentralized cryptocurrencies which they can not control, such as the grandfather Bitcoin and altcoins like Ether, DogeCoin, BlackCoin, Ripple, and more. These altcoins would merely be an extension of physical Rubles, like electronic Rubles held on a debit card or a computer screen at a bank, and not rivals to the existing physical Rubles at all. Importantly, only the financial authorities in Russia will be able to issue, maintain, and control these digital currency Rubles. Once again, the war on cryptocurrencies in Russia is not a blanket one. Instead it is an all-out assault on digital currencies not under the exclusive control of the Russian monetary authorities. This helps to explain why Putin recently called for the country to adopt a total ban on all cryptocurrencies inside of Russia. Putin is especially firm in his denouncement of Bitcoin. When such a ban on Bitcoin use in Russia comes into play, this will be a body blow to the original digital currency and a dangerous precedent to other countries currently considering such a similar move. Yet as you will see next, this will not be the first such ban. Bitcoin would have enough problems in its future with only Vladimir Putin having declared it to be public enemy number one. Yet the greater threat to the father of cryptocurrencies and the many children it has since spawned is the serious one presented by China. This is because China alone accounts for nearly 23 percent of all Bitcoin transactions and trades in the entire world. The Middle Kingdom is similarly the home of a great number of the largest bitcoin miners on the planet. They employ enormous quantities of computing power in order to confirm the transactions of the cryptocurrency. Yet one of China’s biggest online exchanges BTCChina recently stopped accepting Bitcoin trades because of a Chinese government crackdown on the digital currencies which began in earnest in August, September, and October. Their motivation in doing this was that the communist government is rolling out its plans to outlaw all trading not only of Bitcoin but also all of the other alternative currencies on national exchanges throughout China. Presumably this ban will encompass Hong Kong as well. It is immaterial that the ban only covers exchange-based alt currency trading. Even though the over the counter transactions will still be permitted, the hit to Bitcoin traffic and trading will be severe as it loses its official legitimacy in the world’s second largest economy. Not long after the decision had been made, the Shanghai Financial Service Office was ordered to shut down any Bitcoin trading platforms found within the city, according to a report from China Business News. 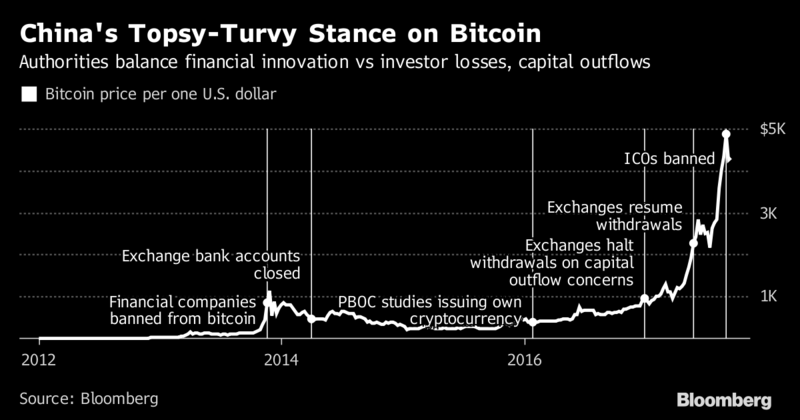 The pundits and analysts are not sure what the motivation for the Bitcoin and alternative currency trading ban in China is. This is smoke and mirrors. Again, as with Russia, the issue is all about control. That is why they will still allow for unregulated off- exchange over the counter trades of the digital currencies. The ostensible reason is that the leadership is fearful of a bubble in the runaway Bitcoin and Ether prices especially, both of which are up hundreds of percent only this year. On the side of the Chinese in this respect are such internationally respected business leaders as billionaire investor Howard Marks and CEO Jamie Dimon of JPMorgan Chase and Company, both of whom have issued warnings of an imminent crash in their values. To give you an idea of how significant the ICO markets were in China until this ban took full force, there were 43 of them in China back in July. Sixty-five different ICO’s had successfully been completed in China and raised fully $398 million per Bloomberg. The market then exploded back in July and August as Chinese technology firms suddenly realized $766 million in crypto-currencies in their national ICOs in only eight weeks, per Shanghai Security News. “Raisiing funds through ICO’s seem to be on the rise globally, and our assessment is that ICO’s are increasing in South Korea as well. Stern penalties” will be handed out for those financial institutions and other entities who take any part in ICO issues. The Friday announcement does not imply that the South Korean government has accepted virtual currency trading as a part of the legitimate financial system. The regulator will continue to monitor the financial markets to determine if other regulations become necessary. South Korea is more important than you might expect as it is one of the three largest altcoin markets in the world today. The assault on the rapid rise of the various digital currencies in the United States is far more subtle. Here under the guise of protecting poor, unassuming investors from ICO scams, the Securities Exchange Commission weighed in on the matter back in July. They began their initial steps in reigning in these start up operations which have raised huge sums of cash through selling off their own brand new virtual currencies in these initial coin offerings. In fact as of then, over a billion dollars had already been raised through ICO’s selling off their own virtual currencies to investors. It was then that the agency ruled that it had decided after a considerable internal investigation that some, if not all, of the virtual currencies which investors were being sold had to be categorized as securities. This means that they must obey the regulations spelled out in the federal securities laws. The concern in the industry is that the ICO sector is dominated by many large and small firms alike. The jury is still out on whether this burgeoning but free-spirited industry will be able to effectively enough organize itself in order to meet the stringent SEC requirements. One thing is clear: the continued dominance of Bitcoin, Ether, and the other main digital currencies is not any longer assured. It may be that the technology which they ushered on to the world stage becomes forced to compromise by submitting to the authority of the dominant global central banks in order for the other benefits of increasingly likely national virtual currencies to be allowed to continue.